You can call them Chalkboards or Blackboards. Either way, we have a great variety for you here. If you need a wall-mounted board, there�s magnetic, non-magnetic, green, gray, or black to choose from. Pick a size and you�re good to go! Speaking of good to go: Are you looking for a board to go? On-the-go Mobile Chalkboards are free-standing boards that wheel alongside you. 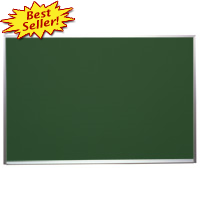 They�re even reversible chalkboards that come in magnetic or non-magnetic surfaces! That�s 2x the writing surface for extra efficiency! Looking for chalkboard material without a frame? No problem! Unframed chalkboard material or self-adhesive chalkboard skins fit your needs! Sidewalk chalkboards, Menu chalkboards, and Tabletop chalkboards are specialty boards for more specific needs. Turn heads on the street with a clever sign that can be rewritten often. Highlight your very-important-item of the week and draw a crowd with had drawn signs! Non-toxic colorful chalk and white chalk stand out boldly on all of our chalkboards. Buy in bulk or buy a few and you�ll be drawing in no time.